There have long been myths and misconceptions about the flu shot, especially when it comes to young children and toddlers. One of the most common is that it causes the flu, an impossibility since the vaccine is not made with a live virus. Even when it is delivered with the FluMist nasal spray (which is a live vaccine), it is created from a weakened form of the virus which is unable to cause the flu. By and large, kids tolerate their flu shots well but, like adults may experience side effects that are typically brief and mild. All in all, the benefits of the flu shot far outweigh any discomfort a person may experience. This is especially true for young children who can develop serious complications if they catch influenza. If any side effect seems concerning to you, follow your instincts and call your pediatrician. In the event of fever, do not use aspirin as this can cause a rare but serious condition in children called Reye's syndrome, an illness characterized by the swelling of the liver and brain. While rare, allergic reactions can sometimes occur, including potentially life-threatening anaphylaxis. If there is facial swelling, breathing difficulty, vomiting, hives, dizziness, rapid pulse, or fainting, call 911 or go to your nearest emergency room immediately. Children should not be given the FluMist vaccine if they are allergic to eggs or gelatin. As with the flu shot, neither children nor teens should be given aspirin to treat fever. 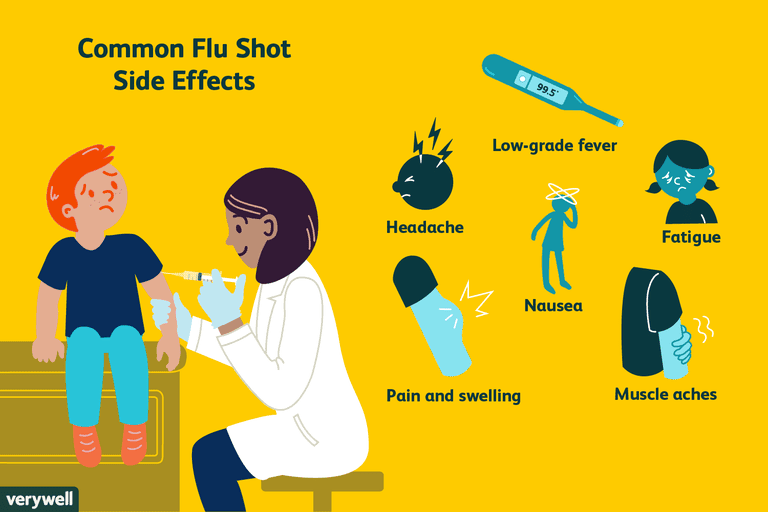 If your child feels unwell after getting the flu vaccine, it is understandable to assume that it was related to the shot. However, it may just be a coincidence, especially if your child is in daycare or around other sick children. Has your child had the flu shot before? If your child has had one before without a reaction, it is unlikely the symptoms caused by the vaccine. When did the symptoms begin? Flu shot symptoms usually appear within six to 12 hours. If an illness appears two to three days after getting the shot, it is probably unrelated. What other symptoms does your child have? Since the symptoms of a flu shot are pretty non-specific, any number of things may have caused them. If an isolated symptom appears, such as nasal congestion, ask yourself if there any other possible cause for this (such as hay fever or a developing cold). Is anyone else sick? If your child gets sick after the flu shot (as opposed to feeling unwell or tired), find out if other mothers have experienced the same with their kids. This is especially true in your child is in daycare where viruses are readily passed from one toddler to the next. How long has your child been sick? If a symptom persists for more than two days or worsens, it is unlikely that the flu shot is the cause. In such a case, it's best to see your pediatrician as soon as possible. In the unlikely event your child has the same reaction year after year, then it is probably not a coincidence. You may need to avoid the flu shot and speak with your pediatrician about using FluMist as an alternative. You should also report the reaction to the Vaccine Adverse Event Report System, a safety surveillance program managed by the U.S. Food and Drug Administration and the Centers for Disease Control and Prevention. Grohskopf LA, Sokolow LZ, Broder KR, et al. Prevention and Control of Seasonal Influenza with Vaccines: Recommendations of the Advisory Committee on Immunization Practices — United States, 2017–18 Influenza Season. MMWR Recomm Rep 2017;66(No. RR-2):1–20. DOI: 10.15585/mmwr.rr6602a1.